The Productivity Manifesto is the outcome of years of experimenting on myself and learning from others to understand what gets us to actually do the things we want to get done. If you’ve ever been frustrated with yourself for not achieving those things you know you should do, you’re likely to find the missing link here. 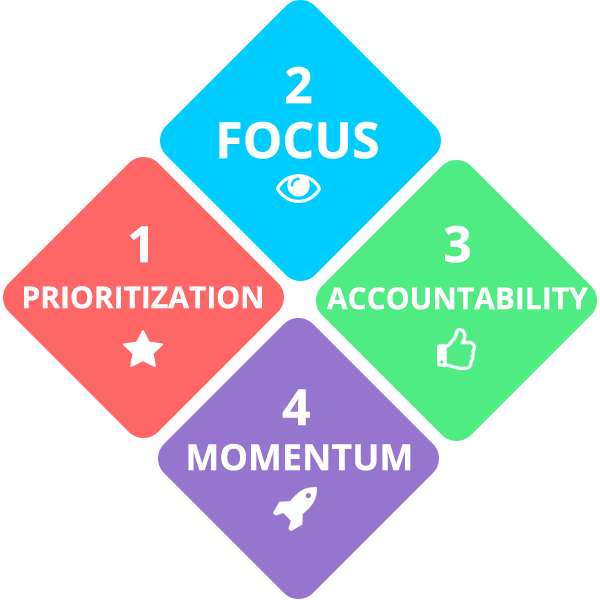 The Productivity Manifesto includes four elements; prioritization, focus, accountability and momentum. When you learn how to use these four elements together, you’ll be able to achieve greater results with less effort and feel a sense of satisfaction that comes from knowing you’re moving closer to your goals. Here are the key principles behind each of the productivity elements. We’ve literally condensed books of theory into a few core ways to work. Plan your day. Be intentional and proactively decide how your day will unfold. Choose 3-5 small, but meaningful actions to do that day. Each action should be achievable in under an hour. Let your team know your intentions (then don’t let them down). Be brave - use positive peer pressure to help achieve your goals. Support your team members and hold them to high standards. By sharing your intentions with others, you harness the power of accountability and get your team pulling in the same direction. Take focussed action. Work on one important action at a time. Do that action until it’s complete (or you’re externally stopped). Block out distractions and less important tasks. Do what you said you do. When you know exactly what’s most important for today, it’s much easier to avoid distractions and get a lot more done. Keep motivated by acknowledging your accomplishments. Use the satisfaction of ticking things off to keep your motivation high. Watch your actions build up and “Don’t Break the Chain”. Seeing your growing list of accomplishments highlights your progress and keeps morale high. The Productivity Manifesto is simple – but don’t underestimate its power. There are plenty of people who know parts or most of these philosophies, but very few people that actually put them into action. Once you do though, this productivity system becomes a self-enforcing loop that helps you achieve more of your goals and greater levels of freedom.